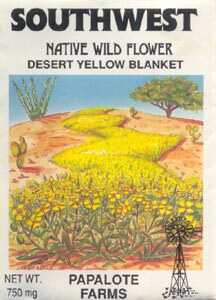 Every springtime, the hills of the desert and semiarid regions of Arizona light up in a vibrant gold color thanks to the Desert Yellow Blanket. Yellow Blanket is a tough wildflower, functioning wonderfully as groundcover. It will grow almost anywhere, and will bloom when nighttime temperatures range between 50 and 55°F and daytime temperatures range between 75 and 80°F.